The reports provide the detail behind why Stockland was recently recognised as the most sustainable real estate company in the world by the Dow Jones Sustainability Index, and as the Global Sector Leader for Listed Diversified Office/Retail companies by the Global Real Estate Sustainability Benchmark. Mark Steinert, Managing Director and CEO Stockland, said: “We have lifted our investment in renewable energy to over $30 million, delivered over $7.7 million in community contributions in FY18 alone, and continue to enjoy strong employee engagement and widespread recognition for our diversity and inclusion efforts. “Over the past decade energy efficiency improvements across our assets have saved our business and tenants over $91 million – so we know that investing in sustainability makes good business sense, in addition to creating jobs and opportunities for people living in our communities,” Mr Steinert continued. 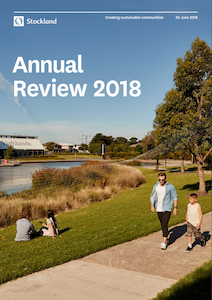 Stockland’s 2018 Annual Review is an integrated report of its financial, social and environmental performance, and is available at www.stockland.com.au/corporate-reporting. Stockland’s online Sustainability Reporting is a series of deep dive reports on the focus areas of its sustainability strategy and is available at www.stockland.com.au/sustainability/downloads. Setting the Australian benchmark for renewables and energy efficiency – Stockland has saved over $91 million since FY06 through energy efficiency improvements, increasing its total investment in solar photovoltaics to $30 million. Contributing over $7.7m to local communities – Stockland has partnered with community organisations to enhance community liveability with 782 community development activities during the reporting period, including inclusive playspaces certified by Touched by Olivia, healthy eating workshops with Jamie’s Ministry of Food, and Heart Foundation walking groups. Comprehensive climate risk management and disclosure – Stockland has been an early adopter of the Task Force on Climate-related Financial Disclosures (TCFD) recommendations, becoming the first Australian property company to lodge TCFD-aligned disclosures with the Australian Securities Exchange in February 2018. Stockland extended its scenario analysis by considering risks and opportunities for the business if Australia trends toward net zero emissions by 2050. Valuing the social contribution of our Retirement Living portfolio – a social return on investment analysis revealed that Stockland creates $1.66 in social value for every $1 it invests in its Retirement Living portfolio. The social value relates to security benefits and reduced social isolation experienced by residents, as well as avoided hospital and aged care costs experienced by government. Industry leadership in Green Star properties – over the reporting period Stockland achieved a 6 Star Green Star – Communities rating for its residential community at Waterlea, and a 5 Star Green Star Design rating for its redeveloped Stockland Green Hills Retail Town Centre. Stockland has the most Green Star rated residential communities and retail town centres in Australia. Furthering diversity and inclusion – Stockland has over 45 per cent female representation in management, with a target of 50 per cent by 2020. Stockland was recognised as an Employer of Choice by the Workplace Gender Equality Agency for the fourth consecutive year, enhanced its LGBTI+ inclusion efforts by participating in the Australian Workplace Equality Index, and was named a Top 20 Employer for Dads.